Your printer/computer may display an HP 02, 02XL ink alert message, such as “non-genuine cartridge”. Press proceed/continue/accept/yes/OK to dismiss this prompt. 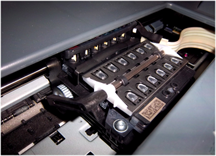 If an “Unrecognized cartridge”, “Cartridge problem” or “Missing or Damaged” message appears, remove the HP 02 or HP 02XL ink cartridge and verify the cartridge is in the correct slot and is installed right side up with the green circuit board (chip) on the right side of the cartridge. 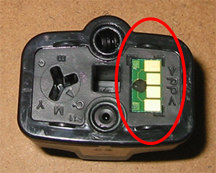 Also inspect the cartridge’s smart chip contacts to ensure the electrical contacts are clean. 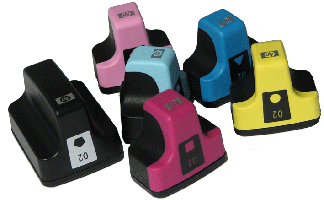 If an HP 02, 02XL “Unrecognized cartridge”, “Cartridge problem” or “Expired ink” message continues to be observed, return the cartridge to your ink refiller to have the cartridge re-programmed and weighed.